Okay, okay, I know I've bragged about my siblings many times before, such as when I was trying to win a contest or when my heart was broken, but I really would not feel right if I didn't bring up my youngest brother's new website, VisionCloud Studio. I think I've mentioned his Nerf gun obsession on here in passing and even showed you a picture of part his collection. Now he's up to some pretty awesome stuff with Nerf guns. 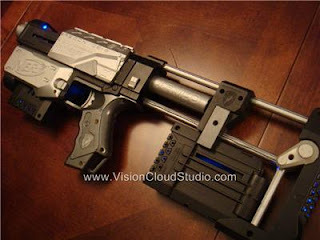 He is now making and selling really awesome looking customizable Nerf guns. I'm talking really cool here. I don't even care or know about Nerf guns and I think these are outrageous awesome! Talk about the perfect gift for your boyfriend, brother or son, right? Take a look at this one available on ebay for loads more photos and information! I'm not a fan of any kind of gun, but I must say they are perty neat...I'm sure my three boys would love one. You and your siblings are so creative...I love it! I am not showing this to Alex...he would HAVE to have it. Well, myabe Christmas! WOW...I'm a girl and therefore probably can't FULLY appreciate what I'm looking at, but they look REALLY cool! My son is SO into Nerf Guns. You brother looks like he's having a blast with that gun, I'll have to check out his site.